the customer takes his order at my physical store? I want to offer this option to my customer (no shipping costs, whatever the weight of the package). Thanks you for your answers my friends. You can indeed do this if you go to your shipping settings (Settings > Shipping) you can set up a free shipping rate there in your Domestic shipping zone. You can set up either a price based rate, which will show customers shipping rates based on the total price of their order, or a weight-based rate, which will show customers rate based on the total weight of their order. 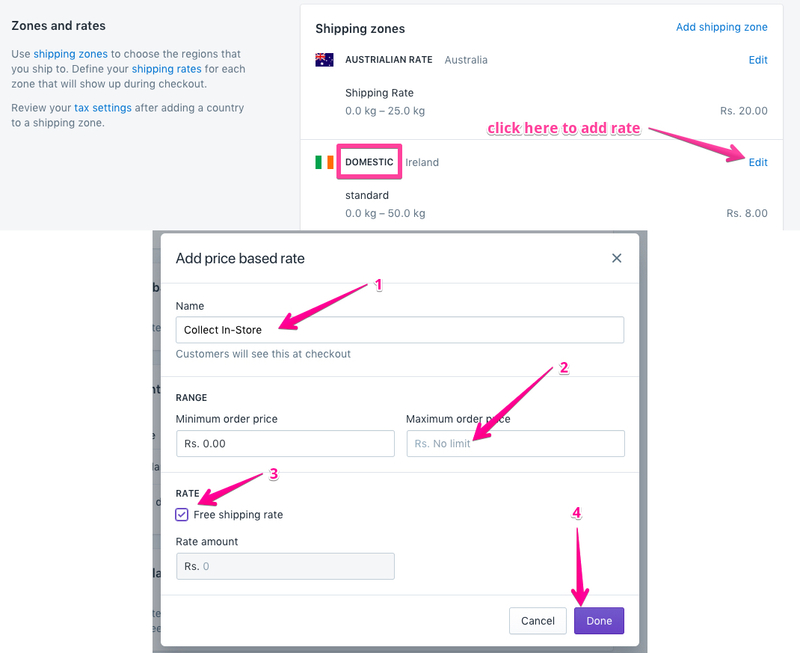 This rate will show to anyone who orders from your country though, so if you wanted to limit it to specific locations, you can either edit the name of the shipping rate to say something like "Collect In-Store - available in X location only", or you can use a shipping app like Better Shipping or Bespoke Shipping to have more sophisticated shipping rates, such as limiting certain shipping rates to specific zip codes or products. For these apps, you would need Carrier Calculated Shipping in order for them to operate correctly. This is normally only available on the Advanced Shopify plan, but I'm sure if you contact our support team here they can have a chat with you about some other options and workarounds! Let me know if you have any more questions, happy to help! Do you know what I mean? Is it an option on myshopify? should I buy another app for that? Thanks a lot Ava for your technical expertise. (i'm french excuse my english). No worries, so all you would need to do here would be to add another rate for express shipping to your Domestic shipping zone. This will make sure everyone within this shipping zone will see the same rates at the checkout. Once you have set up the free shipping rate for In-Store Collection, you can click save, which will return you to the domestic rates page again. 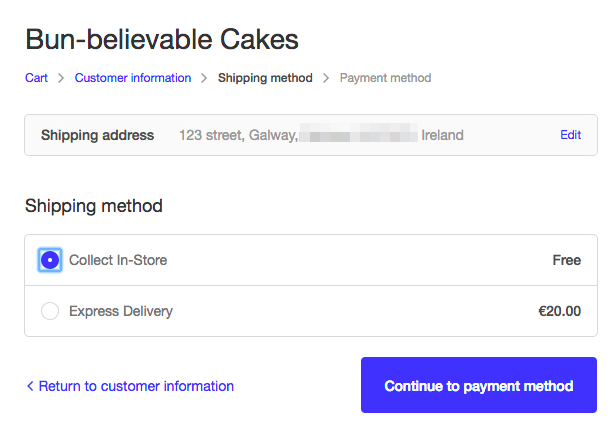 From there, you can click on 'Add Rate' again to add the Express delivery option. You can set up either a price-based or weight-based rate for express shipping which you can call Express Shipping or Expedited Delivery (whatever you prefer!). To determine what rate to set, you would need to know how much it will cost you to ship certain packages. I'm sure if you have a chat with your post office, you can get more information on what rates to charge at the checkout, just to make sure you are covered for the cost of shipping! Just to be aware though, if your domestic shipping zone is France, then this rate will show up for all customers everywhere in France. So for example, if your store is based in Paris, someone from Marseille could also select In-Store Delivery. For this reason, you may be better to use an app to create more specific shipping rates. Or name the Shipping rate "Collect In-Store (must be within 30km of X location)"
Do let me know if you have any more questions, happy to help! Your answer is very professional. Thank you very much for the information and the video. I'm going to put it in practice. I discovered shopify and I would see if it ok to my e-business solution. Thanks again Ava. Good job. No problem at all, Nadine! If you need a hand, you can always check out our webinars to get you started. Webinars (video tutorials) would be a great way to learn about Shopify, as you will be walked through everything step by step and can ask questions at the end. You can sign up for one of our free webinars here. You can watch previous webinars here and on our YouTube channel. I'm sure you will be up and running in no time! Feel free to ask any questions here on our Forums, or if you like you can contact our support lines at any time. Thanks Ava, this description helped me for 2/3 of my issue I have with this. 3. there is one exception to 2.) and this is for only a few products in one category, which are really heavy and need extra carrier service (more expensive). The weight of these products are all the same (but not the price).